Red towers over tall green trees: our first sight of the Golden Gate bridge this morning. Blue skies above, the Bay beneath, and as we drive over the span, we pass walkers, runners and cyclists. I’m travelling with my husband Iain, my son and daughter-in-law and six year-old grandson. They’ve been living in San Francisco for four years now and we visit them twice yearly. We’ve flown in two days ago and now we’re all setting off on a road trip to the Napa valley, wine country. On our last visit, the hills of Marin County were parched and brown; since then, there’s been some rain to break the long drought and they’ve turned green again. We cross a flat river plain and soon the open countryside is replaced by dense forests of conifers. We catch sight of a roadhouse – the Rio Nido – and stop for coffee. The owner is recovering from a wild Valentine’s night celebration and it’s not yet open, but, rather bleary-eyed, he invites us in anyway, offering to make my grandson a plate of French fries. Over coffee, we all get talking – about beer and whisky and the shocking price of real estate in San Francisco, where the owner of the Rio Nido once lived. We’re fed a strawberry cake in the shape of a heart and a slice of King cake, a flaky, spicy confection with multi-coloured icing. My grandson plays with the owner’s blue-eyed dog and a few more customers trail in. When we leave, we feel warmed by the welcome we were given. We drive on to Armstrong National Park, where we park and set off on a hike through the cathedral of giant redwoods. Sunlight flares between the red-brown columns and you have to crick your neck to see the tree-tops. We head up the path, higher and higher, to the crest of the ridge. It’s one of those walks we seem to have done many times before, where the map says it’s a mile, but because of the steep ups and downs you’re travelling three times that much. We see slick red fungi, like fairy-tale toadstools, and birds and squirrels, and the first spring flowers, pinkish-purple and white. Some of the redwoods are more than a thousand years old, some are more than ninety metres high. In spite of the many visitors, there’s a silence in the woods, and a feeling of serenity. We drive on, passing vineyards with acres of low, gnarled vines. It’s too early for them to be in leaf, but on some estates, yellow flowers froth between the rows. Trees smothered in pink blossom line the paths to the wineries. We sample French wine and Italian wine from a biodynamic estate where they plant according to the phases of the moon and talk about the importance of healthy soil. The wine is divine and the olive oil tastes of sunshine and grass. Before my son and his family went to live there, I used to think of California as a place of beaches and coasts and big cities. It’s all those things, of course, but it’s so much more. The area we’re driving through is idyllic and lovely, and the meadows, woods, rolling hills, orchards and winding roads sometimes remind me of the Peak District back home. But then, suddenly, it’s so different, so foreign: we’re staying in Healdsburg overnight, making our way back from dinner at one of those very Californian rib and burger places (‘Bear Republic Brewing Company’). We’re walking back to our hotel along a quiet country lane – and then we hear a noise. At first we think it’s a train, but soon we realise that it’s coming from the creek. It’s an enormous, overwhelming sound, like nothing I’ve ever heard before. I think it must have been bullfrogs – hundreds or thousands of them, announcing their joy at the coming of spring. The next morning, my grandson is in heaven because in the hotel breakfast room is a do-it-yourself waffle-maker and a machine that extrudes golden-brown pancakes through rollers. 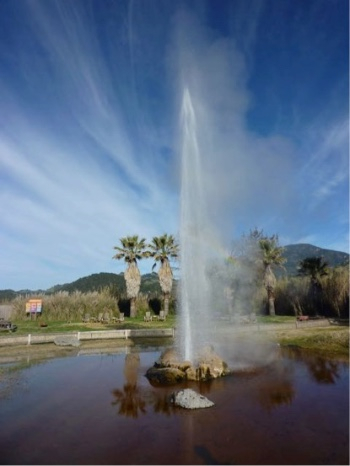 After breakfast, we drive to the Old Faithful geyser at Calistoga. The sun blazes and the geyser obligingly does its thing for us, spurting water into the air every six or seven minutes. A flock of red-winged blackbirds swoops around. There’s an enclosure of Tennessee Fainting goats – animals which, if startled, can go rigid and tumble over. The adults learn to hover beside a wall in case a fainting fit comes on. The grandson plays for an hour in a park in Calistoga, a neat, pretty town of wide streets lined with shops and coffee places. We visit some more wineries, one in an Italianate castle on a sloping hill, complete with turrets and Lombardy poplars, palisaded by high, blue, crumpled hills. We lunch in St. Helena, the sort of chi-chi place where the shoe shops sell Manolo Blahniks and the galleries display ornaments and sculptures about five times too big to fit inside the average British home. Then our road-trip is nearly over, and we set off on the long drive back to San Francisco, playing I-Spy with the grandson, dozy with sun, wine and jet-lag.